management is one of those aspects to establish a successful business organization. Performance management is a process where managers and employees assemble to plan and review employees’ job objectives. It’s a persistent process having prime target to increase employees’ efficacy. Over the years the organizations are looking for a best performance management system that could really boost its productivity. A such system that would be able to stimulate feedback and review system in real-time. According to Global Human Capital Trends 2018, the world of work is demanding more customized and connected network of team. Therefore most of the organizations are saying good bye to performance appraisal system. We are not wrong If we say this is a new era of performance management. Many organizations adopted “Human Capital Management (HCM)” and they really felt revamping in their performance management techniques. This article will mainly focus on how HCM help organizations to establish a successful beginning. Before measuring employees’ performance, it’s a good practice to inform them what actually the need of organization. HCM performance management tools allow to set goals for whole organization or for specific working team. Even an employee can set his/her individual goals to keep align with goals set by stakeholders. Employees can review their goals as many times as they want so distracting from track will not be possible. Feedback process has its own importance in analyzing the performance and attitude of an employee. If this process depends upon single manager then possibly you could miss the precious information. Bringing feedback from co-workers or even from clients can give a more comprehensive information about your particular employee. HCM provides a 360° review or feedback assessment tool which gives more comprehensive analysis of behaviour and attitude of an employee. Employees need to give their feedback on observed behaviour. Based on these managers can create a concise and relevant opinion. HCM gives access to managers to monitor performance of every employee on daily, weekly and monthly basis. Analytical figures based on the performance data help managers to track success and error rates for a given task. Reviewing of both positive and negative feedback about the employees in the entire year gives more clear picture of performance efficiency. The HCM provides a self assessment feature which enable employees to see their day to day activities. Hence they can measure their own performance and key responsibility area (KRA). These performance reviews have prime importance to understand the full potential of working group. This is basically a form of feedback system which communicates with organization’s employees, what is expected of them, where is the gap in performance and how they can fill the gap. Tally is one of the most popular accounting software. Now, it has got the ERP feature. It finds its use in many businesses. In India, over 90% of businesses use it as their primary accounting software. It is probably the easiest accounting software. This helps Tally to penetrate to any area of business. Because, you don’t need a high qualified techie to operate it. Anyone can learn Tally quickly. Many businesses like schools, associations, malls, etc use Tally. In this article, we will discuss how feedlots can get benefit from Tally. In a feedlot, there are many variables and factors that need tracking to increase the profitability. A feedlot or feed yard is a type of animal feeding operation (AFO) which is used in intensive animal farming for finishing livestock, notably beef cattle, but also swine, horses, sheep, turkeys, chickens or ducks, prior to slaughter. So, the variables that are tracked are food or grains eaten by livestock, weight gain, meat produced, sales, etc. In order to track all these variables, a software should have a good input interface, portability, remote access and community support. Tally provides all these features in the simplest way possible. Places like feedlots spread over several acres of land. Thus, they may require multiple data entry stations.Tally Server serves as a backbone to this type of distributed systems. Multiple users with multiple machines can access the same software and data from different endpoints. Moreover, Tally can maintain records of salary detail, payslips , sales transactions and so on. The latest version of Tally has the GST feature which completely eliminates the extra work.You can manage payment information, cheque and so on. This makes Tally really cool for such areas where multiple types of data are managed simultaneously. It also has the feature of zero value transaction like donations. Another most important feature of tally is it can provide graphical view of the data. This helps in quick observation of data. For an instance, the user wants to find the relation between the food consumed by livestock and the revenue generated. Tally will create a graph for the representation of the data. Thus, the user can easily understand the result.It also helps the user to keep in track of the other expenses on the livestock. All these features contribute to the profitability of the livestock farm. Coming to the conclusion, Tally is very helpful software in different areas of business. Also, it is very easy to use. Another important feature of Tally is it supports multiple currencies. This can be the biggest reason behind it’s immense popularity. Other accounting that can substitute Tally are Microsoft Dynamics NAV( now Microsoft Business Central) and Microsoft Dynamics AX. One of the most important income sources from livestock is diary. Milk is the major part of our diet and it is always on demand. Due to the abundant nutrients in milk, it is consumed worldwide. From ice cream to cheese to butter, some of the finest things in life are made from milk.In 2017, the volume of the dairy market worldwide was estimated to be about 216 metric tons, which is projected to grow to 234 metric tons by 2021. Perhaps unsurprisingly, liquid milk takes up the highest share of the global dairy market at 54 percent as of 2017, followed by yogurt and other products.In this article, we will discuss how to increase milk extraction from livestock. 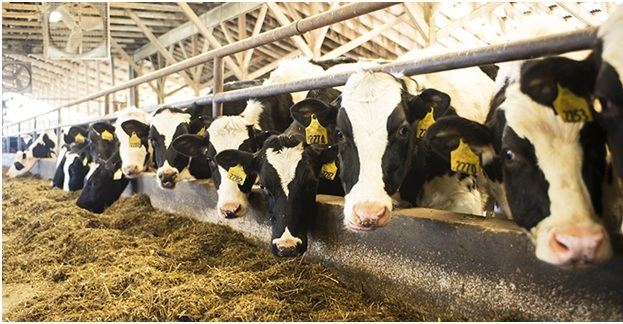 The most important and effective way to increase milk yield is to feed them correct.Each mouthful of TMR feed that an animal consumes contains the right amount of ingredients for a balanced ration. For animals fed with this special ration it has been observed that the milk production increases to five per cent more than those fed with commercial or conventional feeds.However green grass is a must for the animals along with this feed. An animal weighing 300 kg and yielding 20 litres of milk per day requires 13-14 kg of TMR and five kg of green fodder. The buffalo should be dried off approximately 2 to 3 months before expected calving. The dry period is valuable to the buffalo, she may rest and the udder tissue is repaired.In a high yielding herd (above 10 kg per day) the buffalo should be dried off when the daily yield falls below 2.5 kg, even if it is still more than 3 months to expected calving. This goes especially for machine milked herds. An alternative to drying off is to use the buffalo as a foster mother to newly born calves. One buffalo may serve one newborn calf or two older calves which receive additional feed. Care should be taken to dry her off completely no later than 2 months before calving. Another important step is to maintain rumen health. Provide a flake of alfalfa/grass hay for the first five days after calving. Early lactation diet should contain plenty of good quality digestible fiber (31 to 35 percent neutral detergent fiber). Maintain fiber mat with consistent feed intake and avoid empty bunks. Provide free choice buffer, and monitor buffer intake. Minimize the risk of slug feeding or diet sorting that may result in rumen acidosis (low rumen pH; sour stomach). Feeding correct amount of antioxidants can also boost milk yield.Antioxidants (for example, vitamin E and selenium) help reduce the impact of oxidative stress. Oxidative stress could be too much fat mobilization, poor air quality or injury. These all decrease the efficiency of immune system function. These were some steps to maximize milk yield from your livestock. These processes are based on generalized parameters. They may require a change depending upon the atmosphere. Thank You. Inventory data is important to the business’ development. The trend from the data will give insight into how the owner will take care of the demand of certain products without incurring losses. Microsoft Dynamics suite is business and enterprise oriented. This means that it is the perfect tool to store all the data and be used to analyze and forecast different scenarios. It is a centralized ERP system that should be used to manage the replenishment parameters. Businesses facing replenishment troubles probably do not understand the flow of items. To begin with, there are different distribution methods including the direct-to-store and cross-docking. These methods help the retailer to know the lead times in order to capture the right number of products to be stocked in accordance with when needed. Accuracy in calculating the lead times assists in planning and once one gets the number, continuous supply is guaranteed. Particularly, taking note of the peak and the low season leads to organized inventory strategies. Covering high demands will require collaboration with all stakeholders. The production, suppliers and retail professionals have to work together to aid in replenishment efforts. Identifying the seasons also points out promotions that affect the demand. Anticipating the demand for items is crucial in retail replenishment. Really, it is quite simple. In a retail store, there are store keeping units that emerge at the top in terms of sales. The items in the units are the ones that contribute to the market share. If the units are not well stocked, the repercussion will be devastating. To protect your market share, the top items should be stacked at all times and just like that, the replenishment efforts receive a boost. Additionally, item maintenance, the product’s sale rate and having deep knowledge of the supplier world are ways to improvise replenishment. Retailers are faced with the challenging task of keeping the store afloat. But with the above methods of replenishment, it becomes less haunting, it is up to the retailers to implement the right strategies for replenishments and help the business.